Apple presented its all new MacBook Pro, a 15.4" laptop with a 2880 x 1800 pixel resolution (220ppi), making it world's highest-resolution notebook screen! The laptop is just 0.71-inch thick and weighs 4.46 pounds, pricing starts at $2,199, for this budget you get a 2.3GHz quad-core Intel Ivy Bridge processor, 8GB DDR3 memory, a NVIDIA GeForce GT 650M graphics card, 256GB SSD, and a battery that promises up to 7 hours of operation. Hopefully, notebook makers take notice and quit pushing crappy 1366 x 768 screens. 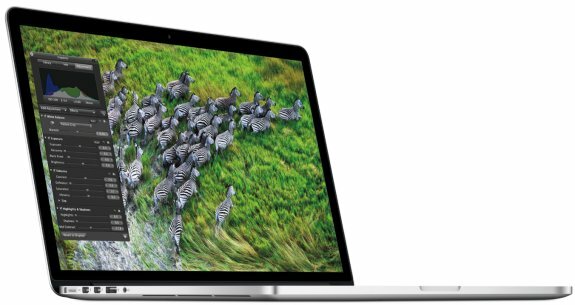 Apple® today unveiled an all new 15-inch MacBook® Pro featuring a stunning Retina™ display, all flash storage and quad-core processors in a radically thin and light design. Measuring a mere 0.71 inches and weighing only 4.46 pounds, the completely redesigned MacBook Pro sets a new standard in performance and portability for pro users.